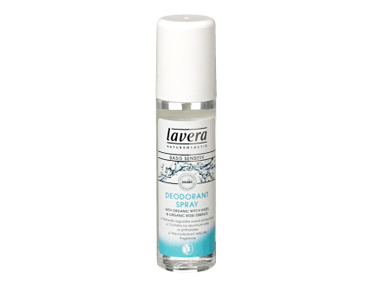 Order Lavera Basis Deodorant Spray from the Online Health Food Store UK. Buy Lavera Basis Sensitive Deodorant Spray and other quality Deodorants safely online in the UK. Lavera Organic Deodorant Spray from the basis sensitive range gives effective 24h deodorising protection and is free from aluminium salts. Lavera Organic Deodorant Spray from the basis sensitive range gives effective 24h deodorising protection and is free from aluminium salts. The gentle, caring and non-pore-clogging formula contains skin calming organic witch hazel and organic rose essence. As official Lavera stockist in the UK, we sell quality Deodorants to customers throughout the UK in England, Wales, Scotland and Northern-Ireland. View more products on the Online Health Food Store from Lavera. Where to buy Lavera Basis Deodorant Spray safely online? Shop at the Online Health Food Store if you are wondering where you can buy Lavera Basis Sensitive Deodorant Spray safely online in the United Kingdom. Our Health Shop is located in the UK and our award-winning independent has been serving customers in England, Wales, Scotland and Northern-Ireland since 1976. You can buy our Natural cosmetics and organic skincare and other quality Deodorants online and we post out orders to any UK address. Basis Deodorant Spray - Lavera Basis Sensitive Deodorant Spray in Deodorants and Personal Care.